Human neural stem cells: image via scienceprogress.org Researchers at UC San Diego have developed a "true human neuronal model" that replicates the early stages of Alzheimer's disease in actual human brain cells. They have accomplished this model by using adult stem cells to more accurately demonstrate the pathology of the disease. The UCSD team took skin cells from Alzheimer's patients who died from the disease and converted the skin cells (pluripotent stem (iPS) cells) into brain cells, using a newly developed stem cell technology. The brain cells developed in the lab closely replicate those found in living Alzheimer's patients. Larry Goldstein, professor of cellular and molecular medicine at the UCSD medical school and leader of the study, said that the cells can be used to observe how the disease progresses and to test drugs for Alzheimer's disease. 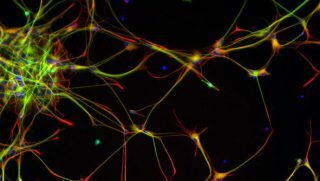 The team's technique, to separate the neurons from various other types of cells, makes it possible to grow the neurons without interference, thereby allowing sufficient quantities to be produced for many studies. Unlike most of the previous research in this area, the converted skin cells were taken from persons with non-hereditary forms of Alzheimer's disease, found in 95 percent of Alzheimer's patients. Alzheimer's 'stem cells in a dish' studies may have implications in diagnosis and treatment of the disease at some future time. The UCSD study will be published in the journal Nature. Today's news in Nature features an interesting article about the study. Social Media & Flash Mobs For National Dance Day!